Photo by Nathalie van Empel, 2012. Courtesy BYU Museum of Art. The term “Renaissance man” is heard a lot, but Paul Anderson, who died suddenly the night of March 23, certainly ranks among them. An artist, architect, educator, curator and composer, he restored historic LDS buildings; sang in the Utah Symphony Chorus for years; has several songs in the current LDS hymnal; was well traveled (just recently returned from a lengthy trip with his son to Spain and France); and spoke Japanese and French fluently. He retired in 2015 after more than 21 years at the BYU Museum of Art, planning to devote his newly found leisure to painting. Who knew that across the street lived a man for all seasons. Here comes Paul. He is carrying another painting, and his feet barely touch the ground. He recently gave himself the gift of time. Time to put his brush to canvas. Time to expand on the rich Cubist tendency his artwork has taken lately. Time to share his artistic talents. He beams, childlike. His work was juried into the Springville Art Museum. ”They like it!” he says. Who wouldn’t? There is an empty place on Roberta Street where the sun went down. Born June 6, 1946, in Pasadena, Calif., Anderson grew up just blocks from the Rose Parade route and rarely missed that New Year’s Day event. He attended Stanford University from 1964-68, graduating with honors in architecture. He served an LDS mission in southern Japan from 1968-70 (and made a return trip there just a few years ago, still speaking the language effortlessly). Anderson attended Princeton University and earned his master’s of architecture there in 1972. He was licensed in California and worked at Pasadena Design Associates for several years before moving to Utah where his career took an unexpected turn when he went to work for the Church History Department. He previously had spent a summer fellowship on Mormon architecture following graduate school under noted Church Historian Leonard J. Arrington. It was during that summer in Utah that he met his future wife, Lavina Fielding, an associate editor of the Ensignmagazine. They settled on Roberta Street in Salt Lake City and lived there ever after in a remarkable old home. She became a well-known Mormon writer, intellectual and feminist. The couple has continued to attend their ward together for the nearly 25 years since her controversial excommunication. They have one married son, Christian, a marine biologist. After he collaborated on the plans for building it, Anderson spent seven years as senior exhibits designer at the Museum of Church History and Art and also restored historic LDS buildings around the world. He always kept his architecture credentials current and worked on designing and remodeling homes on the side. 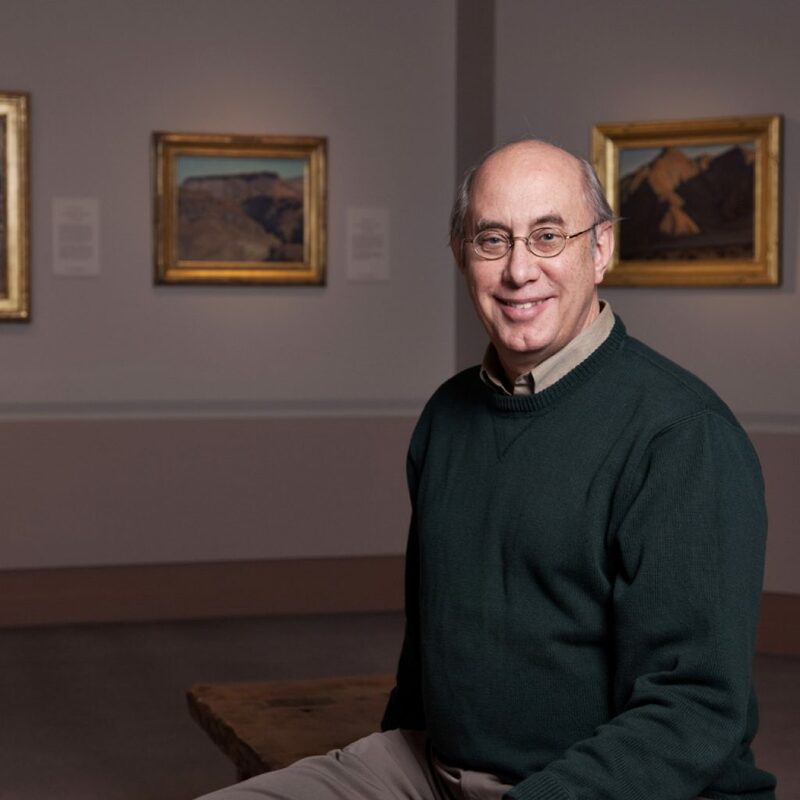 He moved to BYU, where he helped plan the Museum of Art and served first as Head of Design and then as Curator of Southwestern Art, while also teaching undergraduate courses and honors seminars. It was Anderson’s decision, in the majestic China exhibition (Imperial Tombs of China, 1995-96”), to take the single first-century bronze horse that he loved, thought “it could have been a Picasso,” and move it away from other items in the show, placing it in the center of the room in a display case by itself so people could really see it. To this day, I remember that horse. He twice served as president of the Mormon History Association. Still in manuscript form (and hoping for publication) is his book, “Mormon Moderne: Latter-day Saint Architecture 1925-1945.” This was also a very popular exhibit at BYU MOA. Though he sketched all his life, Anderson developed his talent as an oil painter after retirement, through classes each semester at Salt Lake Community College. In just over two years he produced 114 paintings, many created from sketches reflecting his interest in international architecture during his travels. These oils were distributed to friends gathered at his funeral through sign-up sheets. Not one was left behind. Painted Bungalow: 401 E. Williams Ave.